In the wake of the staggering Memorial Day weekend flooding that ravaged Wimberley, Texas, a close-knit group of musicians, artists, and the Brookshire Brothers Grocery have come together to serve as a force of love for their unique community. On August 9, 2015, a premiere benefit concert called TEXAS FLOOD OF LOVE, will be held at The Nutty Brown Cafe & Amphitheater in Austin, aiming to make a difference to the Wimberley Valley community and the families that have endured such heartbreak and loss. Confirmed performing artists include: Ray Wylie Hubbard, Bob Schneider, John Fullbright, Jimmie Vaughan, Hayes Carll, William Clark Green, Jason Boland, Wade Bowen, and Robyn Ludwick. A silent and online auction using Text2Bid will be held starting Friday, August 7, 2015. This auction has unique and autographed items from The Eagles, Willie Nelson, The Dixie Chicks, Merle Haggard, Garth Brooks, Nolan Ryan, Delbert McClinton, Alejandro Escovedo and much more. Friends and family…. let’s fill the space with a flood of love that will be remembered for years to come! “LIKE” and SHARE the Texas Flood of LOVE on Facebook! Bidding opens Friday August 7 at 10am CST and closes Sunday August 9 at 8:30pm CST. By text: Text Love to 71760 to register for the auction or make a donation. 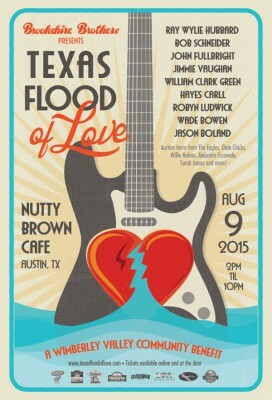 TEXAS FLOOD OF LOVE BENEFIT. John joins Ray Wylie Hubbard, Bob Schneider, Jimmie Vaughan, and lots more amazing musicians in a show to benefit the flood victims of Wimberley, TX. Tickets on sale now!